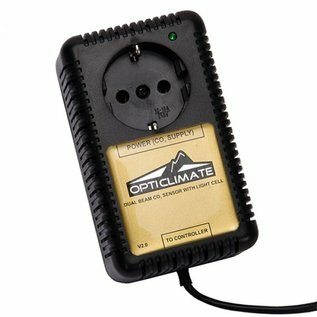 OptiClimate CO2 Sensor for DimLux Maxi Controller. Separate OptiClimate CO2 sensor that can be connected to the DimLux Controller, and which also controls the CO2 generator or CO2 pressure reducing valve. The sensors use the Dual Beam NDIR technology which delivers unprecedented calibration stability and accuracy. Other CO2 sensors are Single beam and need to be regularly calibrated. Dual Beam sensors are two sensors in one where the measuring sensor is periodically adjusted by the second sensor. Because the second sensor is active only 5 minutes per month, it does not age or drift.